This series of 0 to 5 subtraction worksheets serves as a perfect starting point for little ones to understand the concept of finding the difference between two numbers. A number of visually engaging worksheets are sure to keep them asking for more! Topics covered in this web page include column subtraction, horizontal subtraction, theme-based subtraction and connect the subtraction sentences. 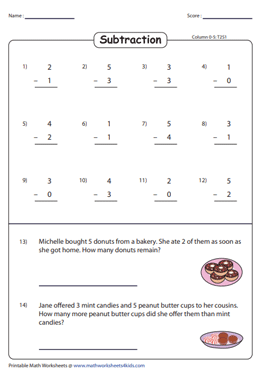 A few simple word problems are featured in the columnar and horizontal subtraction worksheets. Free printable worksheets are also available for ample practice. 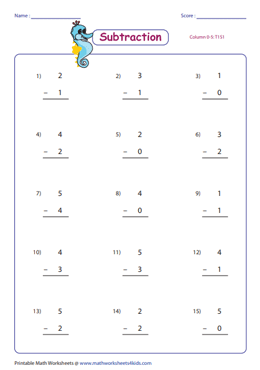 Help young ones grasp the concept of 0 to 5 subtraction with this set of columnar worksheets, which feature two numbers arranged in a vertical format. A total of 45 problems are at your disposal to work in this section. Support your little ones in mastering this set of subtraction worksheets that can be used for practice and review their skills at 0 to 5 subtraction. Use the answer key to verify your responses. This collection of printable column subtraction worksheets also has a number of simple word problems thrown into the mix for variety! Download this set to find the difference between the numbers in the range 0-5. Solve subtraction problems in the horizontal format in the group of worksheets displayed here. Also, two word problems are provided per worksheet to help children gain a better understanding of 0 to 5 subtraction. 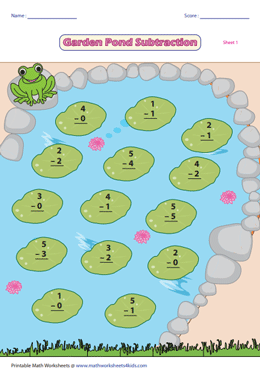 This array of colorful garden pond worksheets that highlights vertical subtraction problems is sure to be a hit with young ones. Download and enjoy this set of eye-catching worksheets! A number of highly interactive worksheets presented here will require students to connect the subtraction sentences on the balloons with the correct difference shown on the jerseys of the children. Print these worksheets for a memorable learning experience.